Gideon Tabor Stewart (August 7, 1824 – 1909) was an American lawyer as well as a newspaper owner and editor. He was very active in promoting the temperance movement. He was elected three times as grand worthy chief templar of the Good Templars of Ohio. Throughout the 1850s he attempted to organize a permanent prohibition party. Stewart was born at Johnstown, New York. He studied at Oberlin College, but left before graduating to study law in Norwalk, Ohio. He later studied under Noah Haynes Swayne in Columbus, Ohio for more than a year, and spent two years in Florida with his brother, before returning to Norwalk, where he was admitted to the bar in 1846. During the American Civil War he published Union newspapers in Iowa and then Toledo, Ohio, before returning to law practice in Norwalk in 1866. 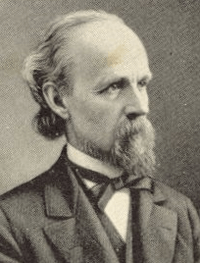 In 1869, Stewart was one of the delegates to the convention that established the national Prohibition Party. Afterward, he served as the party candidate three times for governor of Ohio, seven times for judge on that state's Supreme Court, once for circuit court judge, once for Congress, and once (1876) for Vice President of the United States. Stewart wrote widely on prohibition and related matters. Originally he was a Whig, and joined the Republicans during the Civil War, before joining the Prohibitionist at the end of the war. In 1857, Stewart married Abby N. Simmons of Greenfield, Huron County, Ohio, and had four children. 1 2 3 4 5 Reed, George Irving; Randall, Emilius Oviatt; Greve, Charles Theodore, eds. (1897). Bench and Bar of Ohio: a Compendium of History and Biography. 1. Chicago: Century Publishing and Engraving Company. pp. 205–207.